The Pelagian Islands (from Ancient Greek πέλαγος Pèlagos, i.e. "open sea") is a southern Italian archipelago located in the Sicilian Chanel. 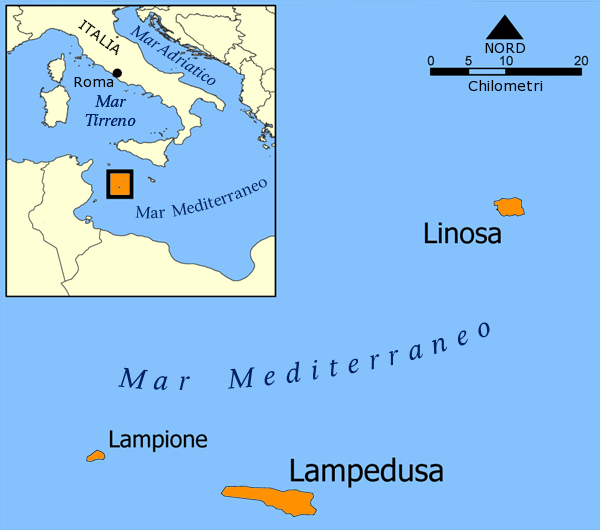 This group of islands forms the southernmost Italian archipelago and it is made up of Lampedusa (the main island, calcareous), Linosa (second by in size, of volcanic origin) and Lampione (a small and uninhabited calcareous islet). At present, the archipelago forms part of the Pelagian Islands Marine Protected Area, which was established by decree of the Ministry of Environment on 21st October 2001. One point on which each and everyone agree upon is the fact that the Pelagian islands, compared to other Mediterranean islands, hosts the least number of species. This owes its main explanation to their distance from the mainland. Linosa, located 163 km from the nearest coast, is certainly the most isolated of the two; its small size, combined with this remarkable isolation, although dampened by the presence of other islands (the Maltese archipelago to the East, Lampedusa to the South-West and Pantelleria to the North-West) with the possibility of stepping stones (lands of gradual colonization), as well to the poor environmental heterogeneity, justify its faunal poverty. Lampedusa, in comparison with Linosa, although having a modest surface and altitude, is proportionally richer in species; this can be mainly explained by its calcareous nature, which seems to offer more opportunities for settlement to many species of Arthropods.